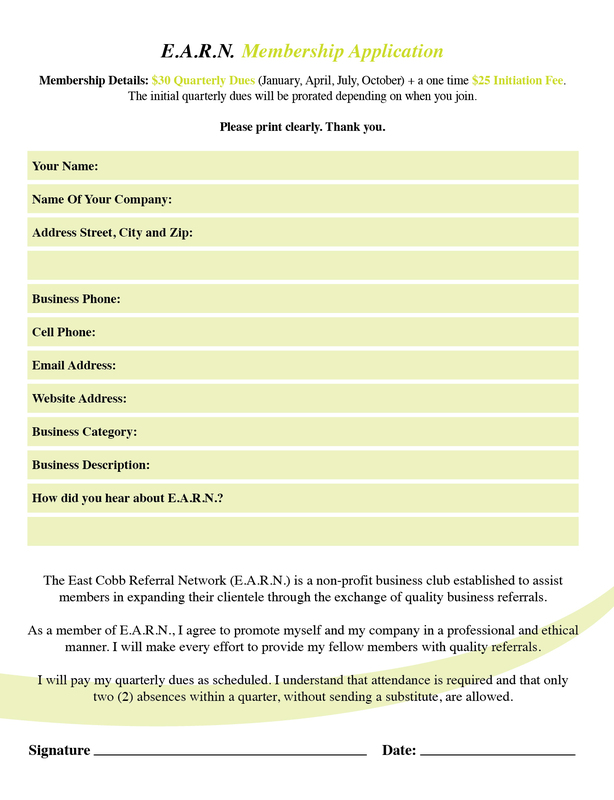 Join E.A.R.N. and develop business relationships in East Cobb, Marietta and surrounding Atlanta, while watching your business grow. Membership is approved by the membership committee once the application is received. E.A.R.N. is a closed networking group. That means that in order to prevent competition within the group, we only allow one member per business category. If a potential member submits an application and there is a question of competition with a current member, the membership committee will consult with the current member to determine if the application should be denied. Fill out the new member application form HERE. Click here for the print version of the E.A.R.N. Membership Application. Just right-click and save or print directly from link.